Behzad, Kamaleddin. "Construction of the Fort of Kharnaq." Digital image. Wikipedia Commons. Accessed August 21, 2010. http://commons.wikimedia.org/wiki/File:Kamal-ud-din_Bihzad_001.jpg. Brass Timurid Tankard. 1498. © Trustees of the British Museum, London. Dupree, Nancy. A69-540. Dupree Collection, Williams Afghan Media Project, Williams College, Williamstown, MA. Lensfodder. "Timur on Horseback." Digital image. Lensfodder's Flickr Photostream. Accessed August 21, 2010. http://www.flickr.com/photos/runnerone/2637824277/. Mahwash, Ustad. Delem Aamada Ba Josh. Radio-Television Afghanistan Archive, 1967. Menten, Alexis. Bibi Khanum Mosque Complex, Samarkand, Uzbekistan. 2004. Menten, Alexis. Chor Minor. March 22, 2004. Bukhara, Uzbekistan. Menten, Alexis. Detail, Chor Minor. March 22, 2004. Bukhara, Uzbekistan. Menten, Alexis. Kalon Mosque Courtyard. March 20, 2004. Bukhara, Uzbekistan. Menten, Alexis. Tile Work Detail. March 18, 2004. Bukhara, Uzbekistan. Menten, Alexis. Tile Work Detail. March 19, 2004. Bukhara, Uzbekistan. Menten, Alexis. Tilla Kari Madrasah, Part of the Registan Complex. 2004. Olmstead, Sarah. "165 Reconstructing." Digital image. Queen Esoterica's Flickr Photostream. Accessed August 21, 2010. http://www.flickr.com/photos/esoterica/2969673070/. Pthread. "Friday Mosque Towers over Herat." Digital image. Pthread's Flickr Photostream. Accessed August 21, 2010. http://www.flickr.com/photos/pthread/. Pthread. "New Tiles for the Friday Mosque, Herat." Digital image. Pthread's Flickr Photostream. Accessed August 21, 2010. http://www.flickr.com/photos/pthread/. Pthread. "Restoration Work at Friday Mosque, Herat." Digital image. Pthread's Flickr Photostream. Accessed August 21, 2010. http://www.flickr.com/photos/pthread/. "Rak Mukam, Tarze Marghore." In Instrumental Music Of The Uighurs. King Record, 1991, CD. Shidetang Printhouse. "Xuanzang." Digital image. National Palace Museum. Accessed August 21, 2010. http://www.npm.gov.tw/exh98/religiouspainting/en_p2.html. Tile, Timurid Dynasty. 15th C. © Trustees of the British Museum, London. UNESCO, and Andrine. The Big Friday Mosque of Herat. UNESCO, and Edouard Bailby. Samarkand. Upyernoz. "The Registan, Samarkand." Digital image. September 19, 2004. Accessed August 21, 2010. http://www.flickr.com/photos/upyernoz/489279/. Waezi, Fardin, and UNAMA. "Photo of the Day: 12 January 2010." Digital image. United Nations Assistance Mission in Afghanistan's Flickr Photostream. http://www.flickr.com/photos/unama/4268268752/in/photostream/. This is how the Chinese pilgrim Xuanzang described Samarkand. Some of the most beautiful accomplishments in the arts, literature, and architecture in Central Asia were produced during the Timurid Empire, whose kings ruled from the great cities of Samarkand and Herat. The great ruler Tamerlane or Timur started uniting the various regions of Central Asia that had fallen apart and fragmented after the Mongol decline. And so in the latter part of the 14th century, he actually conquered a territory that was much larger than the territory and lands conquered by Genghis Khan himself. As the empire grew to include many cultures, it became more stable and prosperous. And the wealth of the royal court, in turn, spurred great achievement in the arts. Artists, like everyone else, have to make money. They have to support themselves. So artists tend to move where there are sources of patronage. At times when the court is rich and the court is munificent, it gives out money, then artists flock to it. So much of the art is created when the court is strong, willing to pay for adventuresome techniques, adventuresome designs, new and different craftsmen, and reward them for what is considered good work. Under the hands of the most skilled artists and craftsmen from across the empire, great cities once again rose from the dust of the Mongol destruction. Samarkand in Central Asia in the modern country of Uzbekistan was one of the most important regions along the Silk Roads. As early as the 3rd Century B.C., it was a critical region, and served as a marketplace and a center of Silk Road contacts back and forth across Eurasia. Samarkand was chosen by Tamerlane as his capital city, and it was during that time that the great monuments and buildings of Samarkand were built. The so-called Registan, the central square in Samarkand is one of the great monuments of Islamic architecture with mosques, Madressas, [...] bathhouses, tombs, all around a central square, which has survived into the present day. After his death, Tamerlane’s son, Shahrukh, moved the capital city from Samarkand to Herat. Herat became a center of the region, attracting artists and traders from as far away as China and the Middle East, and the Silk Road trade revived during this time. 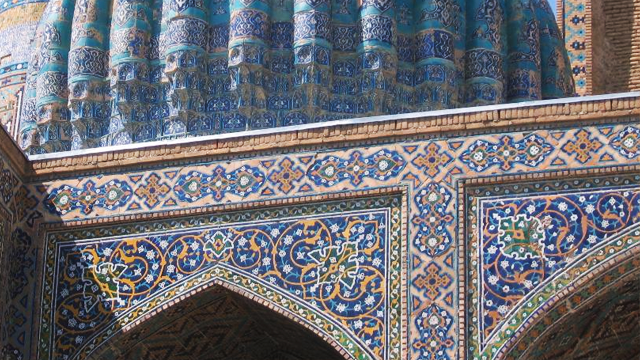 The great monuments built in Samarkand and Herat during the Timurid period feature intricate and distinctive blue mosaic tilework. Few still stand, but the artistic achievement they represent continues to capture the imagination today. One of the high points of architecture in this part of the world is the use of tile to clad the outsides of buildings. Buildings are traditionally made of brick. There’s no good stone for building in this part of the world. Brick is the color of dirt. In fact, the word ‘khaki’ comes from the Persian word for ‘dust’ – khaki means dust colored. So in order to separate the building from the environment, they learned to use colored tile, beginning in the 12th century. This reached its high point in Afghanistan and surrounding regions, in the 15th century, when they made tiles in different colors and cut them up into little pieces, and assembled them in mosaic. So it catches the light and it glows. You have to imagine coming across the Steppe on a donkey or a camel, miles, plodding along and you come to a city like Herat, and what you see are these enormous minarets, very tall – some of them are 70 feet, a hundred feet tall. And they shimmer as you come across the landscape. Today, modern artisans labor to restore the great monuments of this golden age of Central Asia.